Pictures from Snoqualmie, WA (1998 and 2008). When Twin Peaks started to be shown in Germany (September 1991) , there was a lot of hype around the show. I didn't like that, so I missed the pilot (episode 1000). I was channel-surfing when the second episode (1001) came on and I stayed with it. I couldn't figure out what was going on like I could with everything else on TV. So I continued to watch. I was amazed on the depth of the show. It was funny, intelligent, even the supernatural appeared. I watched all the episodes through the two seasons. Twin Peaks truly changed how TV was made. Because I knew I had missed details, I was excited to see the whole show on tape again. It was the first time that I saw the pilot. Only second to episode 2007, it is a masterpiece and the best TV ever aired. David Lynch was the director of those two episodes, so I also became a fan of most of his other movies. Anyway, I collected info and links on Twin Peaks and David Lynch movies here. Here are some of the most important links about Twin Peaks. Careful: spoilers are possible! Dugpa website. News about Twin Peaks and David Lynch. Twin Peaks Archive. Interviews, deleted scenes, and other resources. Pictures from Snoqualmie, WA. 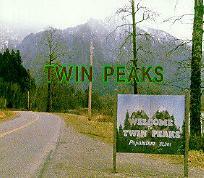 Comparison of pictures from 1989 (when Twin Peaks was filmed) and now (2008). Twin Peaks props. Pictures of props used for filming Twin Peaks. Yearly Twin Peaks fan festival near Snoqualmie, WA. Wrapped in Plastic. Twin Peaks fan magazine (75 issues).